Massive Rotator Cuff Tear and Secondary Arthritis or Rotator Cuff Arthropathy, may be very disabling. Osteoarthritis (arthritis from wear of the shoulder joint), develops as a consequence of massive cuff tears which allow the humeral head (ball of the upper arm) to migrate through the Rotator Cuff Tear, hitting the acromion (bone which caps the shoulder). This may lead to pain, limited range of motion, grinding of the shoulder, and poor functional capacity of the upper extremity. Normally, the Deltoid muscle elevates the arm and the Rotator Cuff acts to balance this upward force to maintain the shoulder in its normal relationship with the cup (glenoid). This balance is disrupted by a massive Rotator Cuff Tear (review the image to the left). Shoulder Arthritis may be very disabling. Osteoarthritis (arthritis from wear of the shoulder joint), may be caused or aggravated by prior dislocation of the shoulder, fracture, prior surgical intervention or other trauma to the shoulder. Rhumatoid arthritis may also cause similar wear and disability. This may lead to pain, limited range of motion, grinding of the shoulder, and poor functional capacity of the upper extremity. The shoulder is the most mobile joint in the human body. Greater mobility, however, increases the risk of shoulder dislocation. Simply, the more contact between cup and ball, the more stable the joint. The hip is a simple example of this. Three major forces hold the shoulder joint in place. First there is a suction between the ball and cup. Second, the capsule and incorporated ligaments of the capsule provide the primary restraint against dislocation. The capsule is often torn or detached from the cup (glenoid) of the joint with an acute traumatic dislocation. Third, the muscles of the rotator cuff act like the reins of a horse holding the humeral head or ball of the joint in place (located). 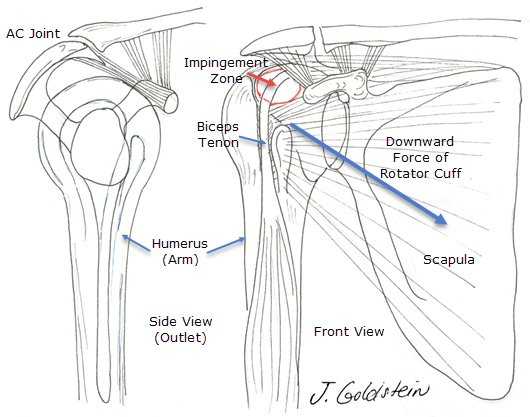 The rotator cuff acts as a dynamic secondary stabilizer. The labrum (lip), a cartilage border between the capsule and cup, also increases the conformity of the joint and the effective diameter of a small glenoid (cup) relative to the large humeral head (ball) of the joint.